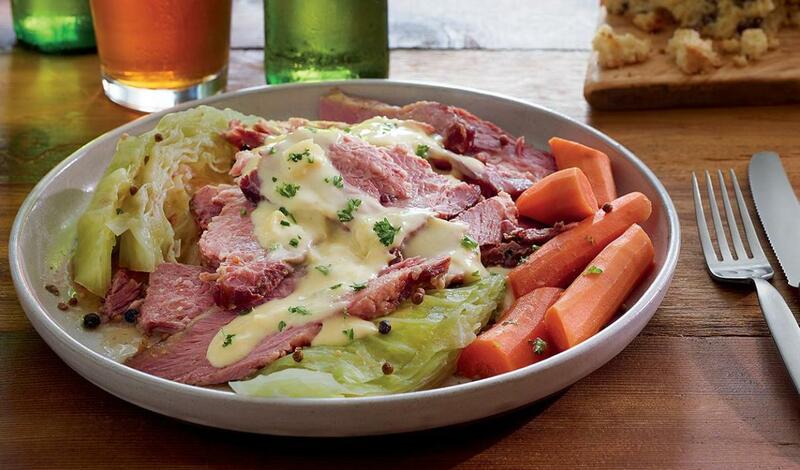 Offer your sliced corned beef with an authentic Irish sauce of chopped cabbage, garlic and Dijon mustard. Serve with Irish soda bread. Combine the corned beef with spices and water. Bring to a boil, cover and simmer for 2,5 hours. delete second after 10 minutes. Add the potatoes and carrots and continue to simmer for 10 minutes. After 10 minutes, add the cabbage and simmer for an additional 10-15 minutes, or until all vegetables are tender. Drain the liquid and reserve the meat and vegetables. Sauté garlic in oil until soft and fragrant. Add prepared LeGoût® Cream Soup Base and Dijon mustard to the pan. Finely chop the braised cabbage from the corned beef, and add to the sauce. Slice the corned beef and serve with the carrots, potatoes and cabbage. Top with the sauce. Garnish with parsley. Serve with Irish soda bread.